James William (Jimmy), the Grandfather of the Kray Twins had the chance of a reasonable start in life. His parents only had two children, although there were three children from his mother’s first marriage, but compared to the hordes of children usually living in one room with their parents, the Krays were not in such a bad position. Jimmy worked as an Electrical Apprentice at a Cable Maker’s Company, this was a great opportunity for him to lift himself out of the poverty of the East End, Electrical works at this time were a New Technology and a qualification in this area would guarantee him a good life for him and any family he may have in the future, even more so he had been made an Overseer Managing staff at the tender age of 17, an indication of his strength of personality as well as natural ability. But life can be cruel, and the sweetest of things can lead to the bitterest of outcomes. In his teens Jimmy fell for a Docker’s daughter five years his senior, Louisa Eliza Turner, lied about his age, meaning that he didn’t have the blessing for the marriage from his father, and married her at St Anne’s Church Hoxton on 5th May 1901. The reason isn’t hard to find, at the age of 16 he had made her pregnant, and a month after their marriage, James Frederick John Kray was born to them in Hackney. So it is without a doubt certain that he would have been under massive pressure, and threats of potential violence from Louisa’s family if he didn’t “do the right thing”. Things started to get worse for him, he lost his job at the Cable Maker’s, had to move house three times in 1901 with a wife and small child, and another one soon on the way, he worked as a Labourer, then a Porter, both poorly paid unqualified jobs, before finding his way to the street markets of the East end where he became a Hawker of flowers, a job he would do for more or less the next ten years. Wheeling and dealing using his wits and drive to carve out a living, the family growing with child after child, John George in 1902, Albert Charles in 1904, Charles David (The Kray twins father) in 1907, Alfred 1909, William George in 1911, and Louisa in 1914. So on the eve of the First World War, he was living in one room in the East End with a wife and seven children. His prospects looked dreadfully bleak. With the outbreak of the First World War (The Great War) Jimmy found a means of escape from this grinding poverty with the guarantee of regular money being available for his family. Jimmy Kray joined the King’s Royal Rifle Company (KRRC) on the 14th September 1914, this tells him a bit about him physically, as the KRRC and other Rifle or Light Infantry Regiments were traditionally recruited from smaller fitter men, expected to march at drill at twice the normal speed and deploy at the jog-trot or run. It also shows that he was quick to sign up. Just as quickly he was shipped to Boulogne in France and marched to the front. While he was in France Jimmy may have heard news from home that one of his second cousins, Clement had died of his wounds whilst serving in the Honourable Artillery Company. Clement had been doing well for himself before the war, he was a young commercial traveller from Harlesdon, and no doubt enjoyed life and expected great things to develop, that was over now. The Honourable Artillery Company consisted of both Infantry and Artillery, and his Battalion had fought at the first battle of Ypres, they had charged the German lines after an artillery bombardment, many of them had been cut down by the Germans on the way in, and had taken a terrible revenge on the Germans after they had surrendered, shooting many of them out of hand. 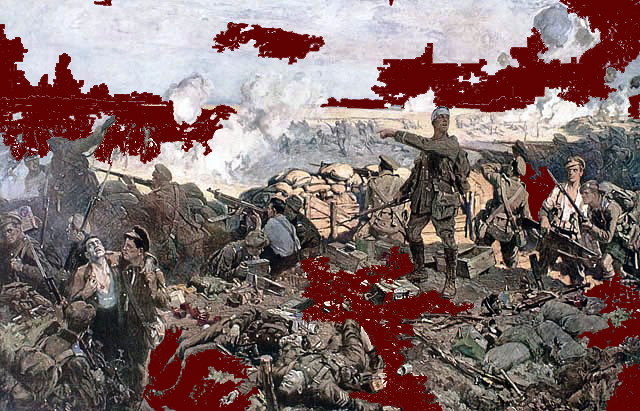 By their own admission many of the men had a blood lust brought on by battle, and such incidence were far from uncommon amongst the hard-bitten British professional soldiers, for example in the same battle 300 German prisoners were said to have been slaughtered after their surrender by the Royal Scots. Ironically the KRRC fought at the 2nd battle of Ypres, perhaps this made Jimmy want revenge, and would see him through his dramatic engagement with the Germans.where the Rifles were supporting a Canadian Corps. The Germans had burst a hole through the french Colonial troops holding part of the front by using poison gas on them, the clouds of yellow gas filling trenches and killing thousands of the unsuspecting french troops. They used the same tactics against the Canadians, and then launched three of their own corps threatening to overrun the Canadian position making a huge dent in the Allied Line, but the Rifles and Canadians fought a ferocious action against Artillery and Gas attacks, and finally faced three times their number of German Infantry pouring over the top and flooding into the Allied trenches. The fighting was desperate, but despite initially being pushed back by sheer weight of numbers, the KRRC and the Canadians made a final stand and fought the Germans to a standstill; the line was badly dented, but held. James was wounded in the fighting , “luckily” receiving a “Blighty Wound” that left him in one piece, but got him shipped back to England and honourably discharged after treatment in 1916. he was awarded The Silver War Badge to wear, a necessary precaution to show the civilians back at home that he had done his duty and had been shipped out of the army because of his wounds, he wore the Silver War Badge as a mark of distinction; men who were thought to be shirking their duty at the front were in danger in the East End of receiving a beating from returned soldiers and their families, so the badge was a necessary precaution. Having said this, the chances of many people who knew Jimmy Kray trying it on with him was probably small once they’d been toe to toe with him, the little man’s reputation for violence was formidable, and had no doubt been considerably enhanced by his time fighting hand to hand with beefy Germans outnumbering him three to one, there weren’t many situations that he would worry about after that. This was published in Punch Magazine in December 1915, it’s not a poem about remorse and hand-wringing guilt, so common after modern conflicts, it was about right and wrong, noble sacrifice and revenge. The trauma these men suffered was channelled in the public consciousness into pride and action, no thought of surrender, quite the opposite. One of Jimmy’s other second cousins, Sergeant George Kray of the Middlesex Regiment, was also discharged from the Army in 1916, and received his Silver War Badge, although he was discharged sick rather than wounded. The number of men suffering debilitating serious illness in the trenches often outnumbered those wounded. Sidney James Kray (another second cousin to Jimmy) was the only Kray to see the war out without being killed, wounded or having his health destroyed. He left the army as a Corporal in the Royal Army Service Corps (RASC) and like the rest of the cousins, served his time in France. It wasn’t just the Kray men who did their part, Alice Kray (another second cousin) joined up and served as a Nurse having seen what had happened to her brothers and cousins. Discharged with his scars and medals, Jimmy Kray came back injured from the horror of the tranches, to a single room filled with children, Elizabeth had been born in 1916, and as a sign of the relentless poverty the family found themselves in, she was the only child to die in childhood in 1918. With no prospects Jimmy went back to trading in the markets, coming to the conclusion that there was money to be made trading secondhand clothes, what was called a Wardrobe Dealer, and he would carry on doing this for the rest of his life. It wasn’t a great living, but then wasn’t bad either for a man with his wits about him. According to Reggie Kray, one of the twins, his grandfather Jimmy would scan the local papers for news of a death, then go around to the house, offer his condolences, and also offer to buy any old clothes from the deceased they may want to get rid of. The logic he used to get the cloths at a knock down price was that it was hard to sell clothes of those who had recently died, so would a few bob suffice? Most people went along with this, especially if the main bread-winner had died and they needed some immediate money for the funeral and drinks for the wake. Using his intelligence Jimmy then took to going around the local housing estates that were springing up in the East End after the First World War offering sets of presentable (cheaply bought) china in exchange for decent clothes, the many new housewives and young couples living on the estates would be only too happy to swap clothes for a nice socially aspirant set of china. He continued doing the buying for the rest of his life, and had the sense to set his son, the Kray twin’s father Charlie, up in a shop in Brick Lane to sell the clothes that he bargained for. The trading brought stability to the family and they continued the family tradition of living in Gorsuch Street from the 1920s till Louisa’s death in the 1950s. However the there was another side to Jimmy, he carved out a good living for his family in the harshest of circumstances, but was a terror around the markets, the little ex-Rifleman was a notorious brawler, just as well, survival would have been difficult with this fire in his blood. However Jimmy took it to another level, and earned the nickname “Mad Jimmy Kray”. Some of this is most likely down to drink, as in later years he would have a heart condition most likely aggravated by bouts of heavy drinking that would lead to his death. Drinking would eventually take its toll on Jimmy; he died in 1949 of a heart condition that was possibly aggravated by past heavy drinking. To see my brief TV interview concerning the Kray Twins’ relationship to the Hamble Peninsula in Hampshire, and their favourite Pub there click here.